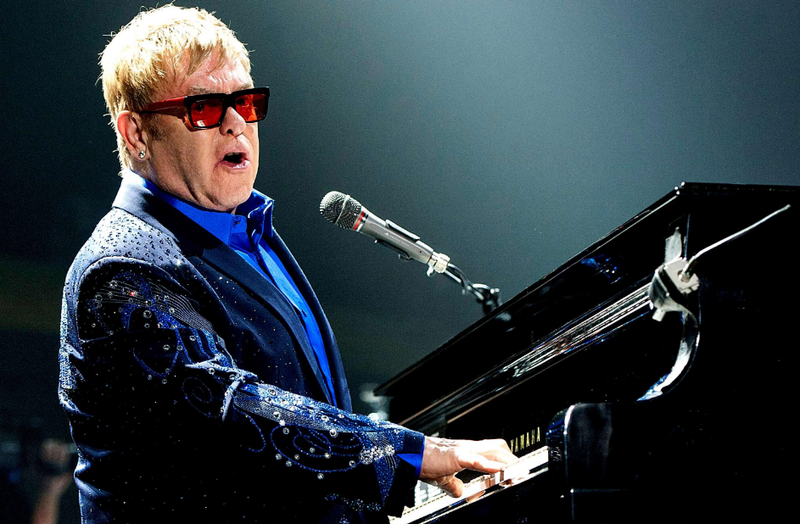 One of the well-known English singer, songwriter, and musician is Sir Elton Hercules John who is famous as Elton John. He has more than fifty Top 40 hits. He has received five Grammy Awards, five Brit Awards, an Academy Award, a Golden Globe Award, a Tony Award, a Disney Legends Award and the Kennedy Center Honors. Elton John full name is Sir Elton Hercules John. He was born on 25 March 1947 at Pinner, Middlesex, England. His was born as Reginald Kenneth Dwight. His father name is Stanley Dwight who served as a flight lieutenant and mother name is Sheila Eileen Dwight. He was raised by his maternal grandparents in a council house. He got an education in Pinner Wood Junior School, Reddiford School, and Pinner County Grammar School. He also had a great interest in playing the piano. He started playing piano at the age of three and at the age of seven he took up formal piano lessons. Elton John’s height is 1.72 m and weight is 87 kg. His eye color is blue and hair color is Red. He has a balanced and healthy body. John Elton became the weekend pianist at a nearby pub named as the Northern Hills Hotel with the help of his mother and step-father. He and his friends formed a band called Bluesology in 1962. Bluesology was the backing touring American soul and R&B musicians by the mid-1963s. The band played 16 times at the Marquee club in 1966. By the time 1967 he wrote music for the lyrics which was posted to Taupin with who he started his partnership. On 7 January his name was officially changed to Elton Hercules John. In 19698 the team joined DJM Records as staff songwriters. He wrote easy listening songs, composed music and was also a session musician. John and Taupin started writing complex songs to John to record in DJM. He released ‘Elton John’ in April 1970. The album became his first album to reach at number four on the US Billboard 200 and number five on the UK Albums Chart. In August 1970, his first concert took place at Los Angeles. In October 1970 album “Tumbleweed Connection” was released. The team wrote soundtracks to the film and the album. Another album “Honky Chateau” was released and it became the top of the Billboard 200. The pop album “Don’t Shoot Me I’m Only the Piano Player” was released on 1973. In October 1973 “Goodbye Yellow Brick Road” was released. The album established him as the glam rock star. John Elton formed his own label named “The Rocket Record Company” which was distributed in US by MCA and Island in the UK. In 1974 MCA released his album named as “Greatest Hits”. In 1974 they released Caribou. In 1975 he received a star on the Hollywood Walk of Fame. He was also named as the outstanding rock personality of the year in 1975. He released his live album named as “Here And There” in May 1976. He also made the guest appearance on the BBC. He became one of the first Western artist to tour to the Soviet Union. John album “The Fox” was recorded in 1981. He was one of the performers in Live Aid held at Wembley Stadium in 1985. In 1985 he recorded material with Millie Jackson and on 1986 he also played piano on two tracks. John received his first solo UK number one hits single in 1990. He earned the Best British Male Award in 1991 Brit Awards held in London. He released many solo and duet songs featuring many artists. He also wrote the songs for 1994 Disney animated film. He was inducted in the Rock and Roll Hall of Fame by Gun’s and Roses in 1994. He also received an award as Outstanding Contribution to Music at 1995 Brit awards. In 1996 the album named “Love Songs” was released. His song was also certified Diamond in United States. He also won the Grammy Award for Best Male Pop Vocal Performance in 1998. He received the Tony Award for Best Original Score in 1999 and Grammy Award for Best Musical Show Album. John and Tim Rice teamed up and wrote songs for the animated film in 2000. In October 2001 he released his 27th album as” Songs from the West Coast”. He signed the exclusive agreement to perform 75 shows over three years in 2003. He was named as Disney Legend for his contribution in Disney films in 2006. He performed his 200th show in Caesars Palace in 21 June, 2008. He accepted the collaboration with Alice in Chains in 2009. John performed the piano duet with Lady Gaga at the 52nd Annual Grammy Awards. In 19 October, 2010 he released The Union. He performed at the Queen’s Diamond Jubilee concert at Buckingham Palace. He also collaborated with rock band Queens of the Stone Age in their sixth studio album. He also received his first Brits Icon Award for lasting impact on UK Culture. In September 2013 he released his thirty first album “The Driving Board”. In June 2017 he appeared in the award-winning documentary. It was also announced that John would be retiring from touring on 24 January 2018. As now his priorities were his children, his husband and his family. John Elton was engaged to his lover, secretary Linda Woodrow in late 1960s. he then married Renate Blauel who is a recording engineer on 14 February 1984. It lasted for only around three years. In 1976 he came out as bisexual. In 1988 he declared that it was comfortable being gay. He began a relationship with David Furnish who is a former advertising executive in 1993. Now he is a filmmaker. They married each other on 21 December 2014 after gay marriage began legally in England in March 2014. They have two sons named as Elijah Joseph Daniel Furnish and Zachary Jackson Levon Furnish. Elton John net worth is estimated to be around $500 million. He is one of the wealthiest people in Britain.